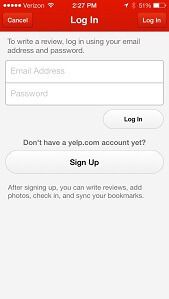 These directions walk you through how to leave a Yelp review for Pioneer Glass using the Yelp app for iPhone. iPad and Android apps have similar directions, but are not specifically covered in this review. 1. 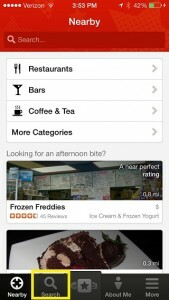 Open the Yelp App on your iPhone. 2. In the main screen, hit the “search” button tab on the bottom of the screen. 3. Click the search bar at the top of the screen. 4. In the “search” field – enter Pioneer Glass. 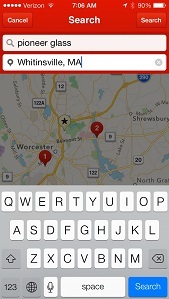 In the “location” field, enter Whitinsville, MA. 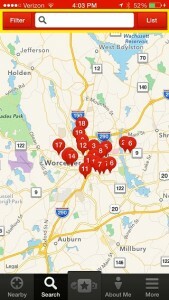 Alternatively, if you’re in Worcester country and have location services on your device on, you can search your current location (app defaults to this). 5. Pioneer Glass should appear on the map. Click on the black pop up that contains the Pioneer Glass details and reviews. 6. You’re now in the Pioneer Glass business page. To leave a review, click the “add review” button on the left of the screen. 7. From here, you’ll need to enter in your email address and password to log in. If you don’t have an account, click the sign up button to be brought to the sign up form. Signing up is simple and takes a minute. 8. You’re now in the rating screen. 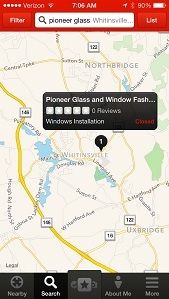 Click on the star that you want to rate Pioneer Glass. Stars work from left to right, so if you want to rate 5 stars, you would click the rightmost star. 4 stars would be second from right, and so on. 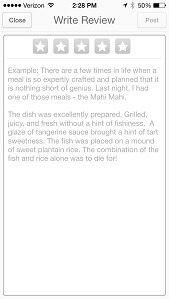 In the “Your Review” field, you can add context to your review by providing a description of services provided, quality of work, etc. 9. Once you’re done writing your review, click “post”. 10. That’s it! You’re all set! 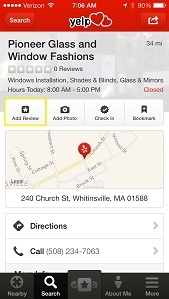 Yelp provides editing and removal of reviews if necessary, which you can see if you view your review on our business page, or view your profile.